In an exclusive interview with Reality TV World on Thursday, Ashley talked about her Survivor experience. Below is the first portion of what she had to say. Reality TV World: What did you think the plan was walking into Tribal Council? Did you think you had convinced everyone to split votes between Ben and Mike, and then hopefully send Ben home on the revote? 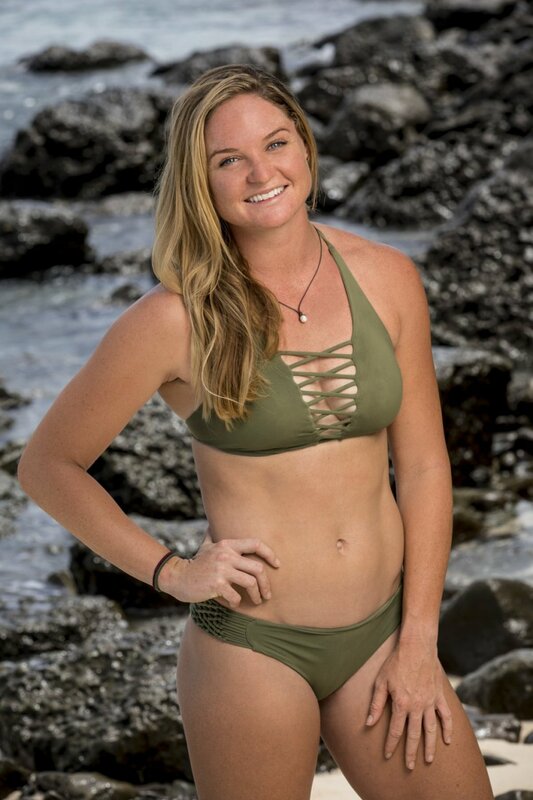 Ashley Nolan: You know, I definitely just thought everyone was so sure that Ben didn't have an idol, that the vote was just going to be Ben. I got mixed vibes from when I threw out Ben and Mike. It was like, "Okay, sure, we'll do that," like, it was not convincing at all. And then I had conversations with Mike -- who was very -- I remember at one point, he actually looked at me and said, "You're not going home tonight. Don't worry." So I was like, "Why are you telling me that?" You know? (Laughs) Okay. Because you might be, as far as I know. But you're having to tell me that I'm not, so I'm a little suspect on that. I was a little suspicious why he was telling me that. So, as soon as Ben put his idol on [his neck] before the votes -- and people were surprised at when he was putting the idol on, like when he was showing that he had an idol -- that was surprising, but I don't think anyone was surprised that he had one. Reality TV World: So it sounds like you think their original plan was to split votes between Ben and yourself -- Chrissy Hofbeck's idea? Ashley Nolan: Yes! Exactly. I'm like, "That was the real plan." Yeah, exactly. It was like, obviously we can't vote for Ben right now, but they're still nodding their heads like they know what they're going to do, and I don't know what to do, so I guess that means I'm being the one voted for. And that's exactly what happened. Reality TV World: Towards the beginning of Tribal, why do you think Ben told everyone to vote for Mike instead of someone like Devon given he had just talked about how Mike wasn't part of a pair and was basically a swing vote with no loyal allies? Ashley Nolan: You know, that's a great question. I think Mike was such a -- what is the word I'm looking for? Mike was such a free agent, that it was a little scary to have him around. Because he was just going around stirring things up. Everyone knows he could kind of tell who was where. I think Ben wanted a Final 3, a certain Final 3, and maybe Mike wasn't a part of that. And Mike was the only person that he didn't know where he stood. I know that it did show when the other three were on the Reward the day before, me and Mike were very vocal saying that we were not going to work with you. So maybe that why he was like, "Hey, if you want to be safe, and you do want to work with me -- because me and Ben had worked together in the past -- then we'll take out Mike instead. That's the other person I'm willing to take out." But I couldn't get anyone else to do that with me. Reality TV World: Mike seemed to be Ben's genuine target at Tribal Council but Ben ended up voting for you, so when do you think Ben was informed of the plan to take you out instead? Like do you think someone just whispered your name to him at some point after he played his idol? Ashley Nolan: I'm trying to remember exactly what aired, but I think I put it out there vocally that it was me. I think it became clear somehow or another that I was under attack. I think he just knew -- and this is just a guess -- but he would decide to go with the majority in order to not piss anyone else off, basically. Since everyone was already writing my name down, you might as well write my name down too instead of, you know, writing someone else's name down that he'd be alone in and then you just have one more person upset at you. So I don't really know what his thought process was there, but I definitely think with me kind of showing, "I think it's going to be me," he was like, "Yeah, it seems as though everyone is voting for you." But maybe they had a conversation before Tribal with them saying, "We're voting for Ashley," and telling that to Ben. But I didn't see anyone talking to Ben before Tribal. I don't know, that was a surprise to me that he voted for me too. Seeing that last night, I was like, "Oh, interesting." Reality TV World: Your tribemates, especially Chrissy and Devon, have come across very proud and sometimes stubborn, mainly through their interactions with Ben. Do you think Ben telling everyone to vote Mike played a big role in your ouster because Chrissy and Devon were just too stubborn to give Ben the satisfaction of following through with his own plan? Ashley Nolan: Yeah, unfortunately at that point, the only person willing to work with me was the last person everyone else wanted to work with. So I think, for sure, that's a great point. That, like, they were like, "Sorry, Ash, maybe we would work with you right now, but that would mean giving Ben the satisfaction of getting what he wants, or him calling the shots," and I think they just didn't want any part of that. And I think maybe, there's a good point: Ben and I did have a big falling out when he found out that we were gunning for him, and this and that. But I think still, at the time, I might've been seen as somewhat closest to Ben. And maybe that wasn't portrayed too well on the show, but I think there maybe was an underlying tone that there was a chance I would've gone back with Ben, especially now that Devon had swapped. Ben would've been my go-to move out of desperation, you know? Because everyone had decided to play against me. (Laughs) So, yeah, I think that was a good point. Just because Ben was the one who said, "Let's vote Mike instead," everyone was like, "We're definitely not going to do what that guy [says]." Yeah. Be sure to check back with Reality TV World soon for more from our exclusive Survivor interview with Ashley Nolan.